Warts – also known as Veruca Pedis, Plantar warts and Papillomas, are a living growth caused by the Human Papilloma Virus (HPV). Warts can appear anywhere on the feet and are usually cauliflower like in appearance and painful to squeeze. If over a weight baring area they become quite flat and are pushed back into the skin which often causes pain to walk. Children seem to be quite prone to catching warts and we usually see more children for treatment of warts over the summer months especially at school swimming time. Warts are contagious and often caught in public pools and showers so make sure you wear thongs at all times at these venues. There are several treatment options for warts which will be discussed with you by your podiatrist – at our clinic we offer pain and chemical free treatment options for children. Tinea – also known as Athletes Foot, is a fungal skin infection that effects the feet. It can appear between the toes where there is too much moisture with redness itchiness and fissuring. It also occurs anywhere on the feet and often on the plantar surfaces and symptoms include dryness and peeling skin, redness and itchiness, small blisters with fluid may appear also. There are many treatments available for tinea and your podiatrist can discuss what will work best for you and advise on preventative tips such as choice of socks and footwear. Tinea effects feet of all ages and can be common in teenagers with sweaty feet combined with at times poor hygiene. Our clinic also offers chemical free treatments options for children. Ingrown Toenails occur for all ages sometimes even at birth, and common in age 12 to teenage years. This age group are usually attending to their own nails – but may not always be cutting them correctly and and parents aren’t always aware of the issues initially. Sweaty feet can contribute to the tendency for the nails to grow in. 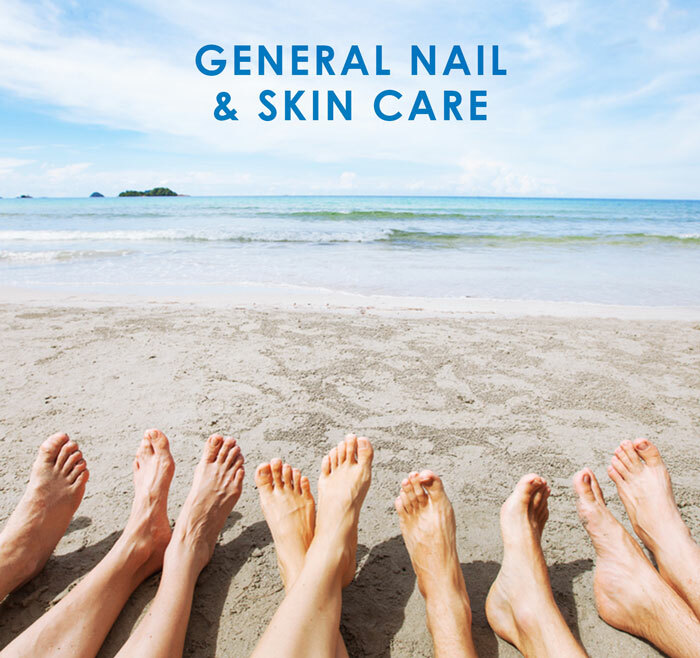 Ingrown nails are most commonly the big toenails but can occur at any nail and result from a nail spike growing into the flesh of the toe. They are very painful often appear red and inflamed and weepy with pus. If left untreated they can become infected and require antibiotics. They are often caused by not cutting the nail properly, poor fitting shoes or simply the shape of the toenail. Dermatitis/Excema are a group of diseases that result in inflammation of the skin. There are various conditions that cause dermatitis including as a result of allergies, irritants, and poor venous circulation, some causes are unknown. Many people suffer from some form of dermatitis which often begins in childhood. Some symptoms include blisters or dryness and thickened skin. At our clinic we can offer advice including natural remedies to help with these symptoms. Sweaty Feet can be caused by a number of issues from sweat gland disorders to exacerbation due to synthetic socks and footwear. Sweaty skin can be at higher risk of blisters, and in some cases bacteria infection which causes a strong odour. Children often have sweaty feet – making sure socks are made from natural fibres helps to minimise this and spending time in bare feet when practical. There are treatment options depending on the severity and these can be discussed along with preventative tips with your podiatrist. Blisters are a small sac of fluid that form under the skin over areas of friction. They can be superficial or form in deeper layers of skin below areas of callus. Sweaty skin is more prone to blisters and treating that can help. Blisters are common with children due to sweaty feet and often due to wearing in new shoes. We recommend keeping a blister intact to avoid breaking the skin and risking infection however your podiatrist may need to drain a blister to relieve pain in some cases. Your podiatrist will discuss preventative measures and also look at your foot mechanics to give advice regarding pressure or fiction areas on your feet. Some children are born with curly toes – commonly one or both of the 4th toes. This can be genetic, or due to a longer toe that curls under the toe next to it which is usually more noticeable when a child starts to walk. In most cases curly toes from birth are not a problem but may require some monitoring with your podiatrist as your child begins walking and wearing shoes. If this condition appears to worsen with walking and the toes appear to be gripping this may be contributed to by foot alignment and mechanics and may require further treatment. Sometimes simple strapping techniques can help improve toe alignment in young children. Pain in any area of a child’s body – foot, ankle, legs, knees or hips isn’t normal and should be assessed. Foot alignment and mechanics have an influence on how well the rest of the leg and the main joints, the ankles, knees and hips are aligned and function. The feet really are the foundation of the body and need to be well aligned and functioning in a stable way. One sided pain may indicate a leg length discrepancy or relate back to a previous injury. Children have active lives and are often playing all sorts of different sports or involved in dance or gymnastics. Sometimes poor footwear is a contributing factor also. 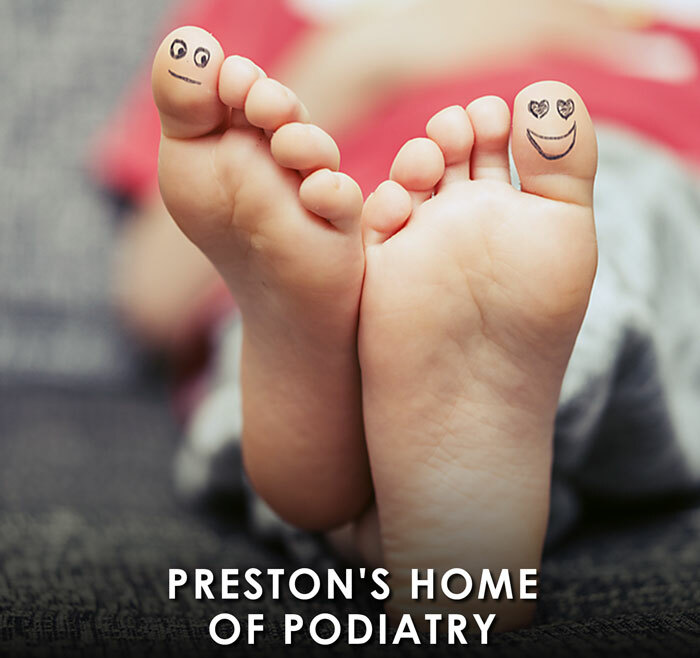 Podiatrists at Podiatry4kid & Adults are experienced in assessing children’s feet and their whole body posture and importantly providing advice and treatment options that look at all of these factors. Diabetes Mellitis is a group of metabolic disorders where there is a high blood sugar level in the body. Type 1 involves the pancreas not producing enough insulin and usually occurs in children. Children and adults with Type 1 diabetes need treatment with insulin to survive. Long term complications of this form of diabetes can effect the circulation and neurological systems in particular to the feet. Monitoring and understanding foot health and diabetes is a good habit to get children into to help prevent complications later on such as poor wound healing, ulceration and numbness. Bunions are the actual boney lump that gradually form over the inside of the big toe joint – Hallux Abducto-Valgus or HAV is the term that describes how the big toe changes direction and rotates due to pressure and mechanical forces at the joint during gait. Certain foot types can be more prone to HAV and bunion formation and are often hereditary. Poor foot mechanics play a big part where excessive pressure results at the big to during gait. Certain activities such as soccer and football and ballet are also contributing factors. Children can develop Juvenile Bunions from the age of 10-15 in these cases there is a strong genetic component. At Podiatry4kids and Adults we are experienced in assessing foot types prone to bunions and can advise on orthotic therapy to slow down this process especially when we are assessing and working with children. Metatarsus Adductus is a condition where the foot turns in from the middle of the foot to the toes – the big toes commonly adduct and create a gap between the 1st and 2nd toes. It is common in children under 2 years of age and one of the causes of an intoeing gait. For children under 2 this condition can be helped with strapping and padding in shoes, and for older children orthoses may be indicated. Genu Valgum commonly known as knocked knees, is a condition in which the knees roll in and touch each other when the legs are straightened and when standing. In some cases children are unable to stand with their feet together due to the angle of the knees. This condition is most common in 2-5 year olds. Pronated or rolled in feet are usually an underlying contributing factor that influence the angle the knees can operate on. Children in general often have quite flexible joints – and those with genu valgum can be quite hyper-mobile in their joints which encourages feet and knees to roll in. Orthotic therapy is usually indicated to help align the feet and knees along with advice on supportive footwear. Children with this complaint walk with their feet/toes turning in – they are usually not in any pain unless they also have very pronated feet which may cause leg tiredness or knee pain – but may be at higher risk of tripping and as a result injuring themselves. In-toeing can be a complex issue and can be caused by 3 main factors – Metatarsus Adductus (turned in foot/big toe), Tibial Torsion (shinbone/leg turns inwards) or Femoral Anteversion (Thigh bone turns in). There is often a genetic component and the hip position can also influence the position of the leg and foot. Hip, leg and foot positions can be influenced in the womb usually if there is not enough room or the feet or legs are squashed into certain positions. In-toeing is usually first noticed when children begin walking and is most common in children under 8 years, but can also spontaneously appear at any age during childhood. It can effect one or both feet/legs/hips. Treating in-toeing usually involves advice re footwear, gait exercises and in some cases orthoses. At Podiatry4kids & Adults we work closely with other practitioners often Osteopaths and sometimes Kinesiology to assess and treat the hip and leg position and re-balance muscles and gait patterns. In-toeing can be complex to manage and often involves other issues such as pronated or flat feet and your Podiatrist will explain and discuss your child’s conditions and treatment options in detail. Toe Walking is the tendancy to walk on the toes without placing the heel to the ground and is commonly seen in toddlers. There are a range of factors that cause toe walking including short achilles tendons, muscle spasticity, habitual patterns (no known cause) and is often associated with conditions such as cerebral palsy and autism. Long term toe walking can result in calf muscle shortening, have an effect on the posture – toe walkers often lean forward creating tight muscles in the pelvis and hips, and there can be issue getting used to wearing shoes. Adaptions to shoes and orthotic therapy may be indicated and working closely with an Osteopath to release and stretch tight muscles in the leg and pelvis is often important. Depending on the age of the child night splints are another treatment option that may help. Hypermobility is a common condition for children where joints move through their range of motion more easily and beyond the normal range. There is a genetic factor with hypermobility and other causes may include abnormally shaped joints, abnormal joint proprioception and in some cases children may develop Hypermobility Syndrome or other collegen or connective tissues disorders such as Elhers-Danlos Syndrome. Children may experience joint or muscle pain, higher risk of frequent sprains and injuries, ligament laxity and spine scoliosis. Orthoses and supportive footwear are usually recommended by your podiatrist other treatment may include strengthening exercise and activities and strapping. Flat feet or Pronated Feet or Rolled in Feet usually have quite flexible joints and the range of motion to roll in or collapse through the arches. In children under the age of 2 years it is normal to have flat chubby feet but by 2 years of age some development of an arch should be visible. This foot type in children often requires more muscle energy is required than normal during gait to maintain unstable joints thus resulting in fatigue or tired aching feet and legs, so the children who don’t want to walk far or want to be carried. Pronated feet or rolled in feet do not necessary always result in a lowered or flat arch. Pronation is the motion of the joints in the rear foot that control to some degree how the whole foot operates. Feet that pronate during gait appear to be rolled in at the heels and medial ankle and sometimes have a lowered arch but not always, and there is excessive pressure under the ball of the big toes when stepping forward. Pronation at the foot can also result in internal rotation at the legs and knees. There are many symptoms or foot conditions that can be as a result or contributed to by pronated feet and your podiatrist can assess and explain how your child’s feet function and the related issues and then advise on the best treatment plan to suit your child’s feet. 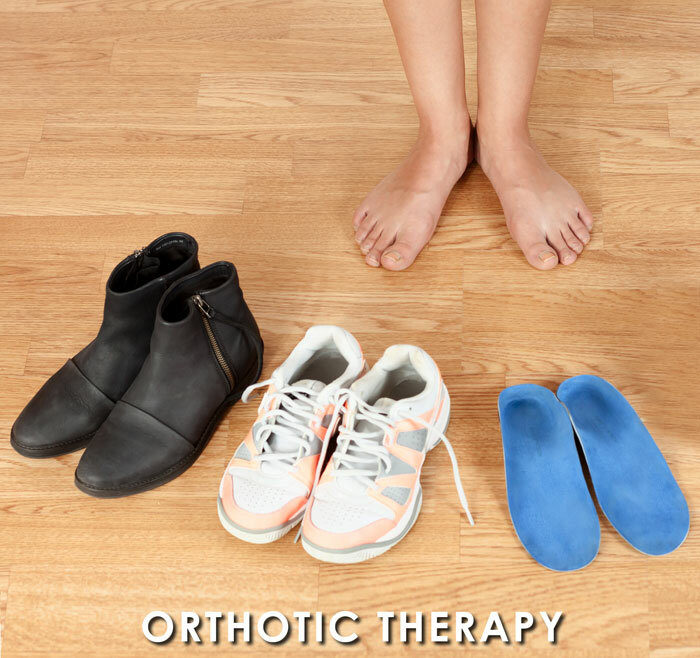 Orthotic therapy is often indicated with flat feet, pronated or rolled in feet. Pronated feet don’t always present with pain especially with children however a range of potential issues related to pronated feet may occur at some stage and our experienced Podiatrists are able to advice you on preventative orthotic therapy related to your child’s feet also considering their hereditary history and activities including sports and dance. A Leg Length Dispcrepancy means you have one leg longer or shorter than the other and is quite common in both adults and children. LLD can be structural or functional – see below for both types. Signs to look for for both types of LLD – one foot rolling in or one foot rolling out more than the other, uneven wear patterns on shoes and one sided pain in the foot, ankle knee or hip. A full assessment with your podiatrist will determine the type and likely cause allowing them to discuss your best treatment options. In most cases LLD is functional and as a result of a tight joint or muscles on one side of the body – often the hip or a pelvic imbalance. Many things can cause this to happen such as activities at work that require standing and twisting in one direction, or sports such as soccer and football where one side of the body is used differently to the other. Functional LLD often results in the feet compensating for the imbalance and one foot functions differently to the other which over time can cause pain in one foot. A functional LLD can usually be resolved by working on the tight joint or muscles and re-balancing the area with stretches. Unstable foot mechanics can also contribute to pelvic imbalances so several components need to be assessed and treated. Structural LLD is less common and results from an actual difference in the bony length of one leg to the other. This can develop from differing growth rates as a child, sometimes due to disease or treatments such as chemotheray that interfere with bone growth plates, injuries and surgery to a bone or joint can result in a change in the length. Sometimes other factors including scoliosis of the spine or damage to spinal discs that alter the alignment of the pelvis result in an imbalance that creates one shorter leg on standing. A structural LLD often does require a heel lift to even up the body and reduce the compensatory changes in the feet and body that often can cause pain. ‘Growing Pains’ are commonly described in children as painful muscles in the legs usually over night but also used to describe all sorts of pains in the limbs. Although there is no known cause other than a possible link with growth spurts – our experience as Podiatrists and in working with children for many years suggests that there is quite often an underlying mechanical issue with the feet and legs which results in tired aching legs at the end of a child’s day full of activities, which may be exacerbated during times of growth. Some children seem to be more sensitive to pain also. We have found that orthotic therapy combined with Osteopathic treatment where indicated works in most cases to ease tired aching legs and night pain that wakes children up. A full bio-mechanical and gait assessment is important for us to give advice on the best treatment plan. Tired Aching legs and Clumsiness – children may complain about tired aching legs and asked to be carried not wanting to walk too far. This may be a result of over working muscles that fatigue quicker than normal. Muscles in the foot and leg have to work hard if the feet are flat or rolling in too much. Clumsiness can also be a symptom of fatiguing muscles and joints that are out of alignment. 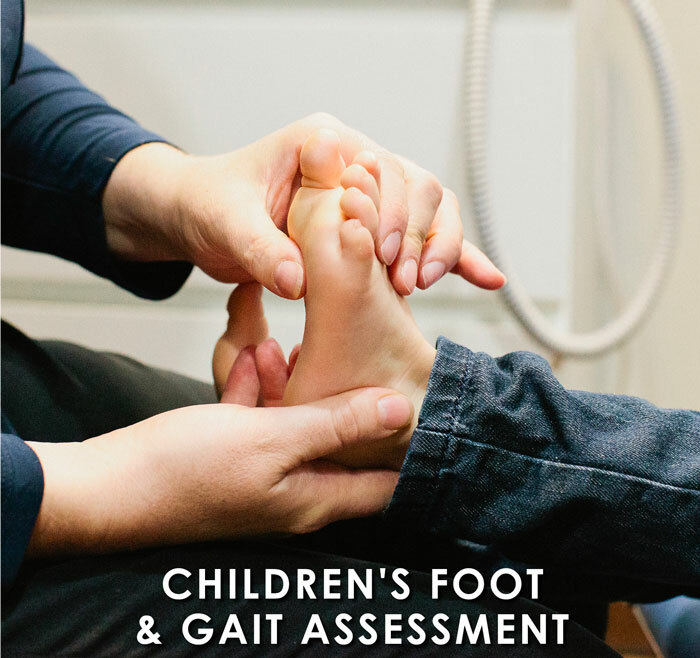 A foot and gait assessment of your child will allow your podiatrist to assess their mechanics and advise if orthotic therapy may help. Severs Disease is one of most common causes of heel pain in children, often occurring during adolescence when children hit a growth spurt. During growth spurts the bones sometimes grow a little quicker than the tendons which creates strain on tendons and pain where they attach to the bone. Also known as an osteochondrosis or apophysitis, Sever’s disease is an inflammatory condition of the growth plate in the heel bone (calcaneus). Children usually complain of pain in the achilles tendon also. It is a common condition amongst children who play a lot of sport. Treatment includes rest from sport, strapping, calf stretches, heel pads/lifts, orthotic therapy and foot wear advice. In Osgood-Schlatter disease, children have pain at the front of the knee due to inflammation of the growth plate at the upper end of the tibia (shinbone). The boney bump at the top of the shin where the knee cap tendon attaches gets inflamed and can become enlarged. This condition is common in active children playing a lot of sport and triggered by a growth spurt. Treatment includes rest strapping and foot wear advice . Underlying foot mechanics may need to be assessed and treated with orthoses if knee alignment is contributing and a referral for Osteopathic treatment on the knee is common advice also. Autism is generally characterised by difficulty communicating and developing relationships with other people through language and abstract concepts and will typically present in early childhood. It has also been found that children with Autism may have difficulty in performing and developing gross motor skills, coordination and balance which are all factors that contribute to gait patterns. Other factors effecting the gait are delayed or atypical motor developments, low muscle tone (hypotonia), poor balance, coordination, joint proprioception and an awkward gait pattern. Orthotic therapy and footwear advice may help. It is common for children with autism to toe walk and have sensitive sensory which may effect the wearing of socks and walking bare foot on certain surfaces. Cerebral Palsy occurs due to an impaired muscle coordination known as spastic paralysis and other disabilities, which have been caused by damage to the brain before or at birth. Spasticity occurs as a result of increased muscle tone, which results in muscle stiffness. This muscle tightness makes movements difficult and can effect posture and balance. Toe walking is a common issue also. Podiatry can help with pressure areas orthoses and footwear. Anyone can present to have their toenails cut often because either the nails are difficult to manage (see conditions below) or due to issues related to age including an inability to reach or see, pregnancy and an inability to reach, and arthritis in the hands. Some people simply enjoy the pampering! Occur for all ages sometimes even at birth, and common in age 12 to teenage years (sweaty feet that parents aren’t always monitoring closely!) Ingrown nails are most commonly the big toenails but can occur at any nail and result from a nail spike growing into the flesh of the toe. They are very painful often appear red and inflamed and weepy with pus. If left untreated they can become infected and require antibiotics. They are often caused by not cutting the nail properly, poor fitting shoes or simply the involuted shape of the toenail. Can be difficult to resolve and usually its a slow process. They are often discoloured – yellow or brown, sometimes white on the surface, sometimes thickened and crumbly and difficult to cut. At our clinic we can suggest a range of treatment options depending on the site and severity and offer chemical free and natural treatment options also. Thickened Toenails tend to occur over time and with age. Sometimes they are a result of an injury or trauma to the nail bed or low grade pressure over time from footwear exacerbated by certain footwear types or activities such as running. They are difficult to cut and are easily managed by your podiatrist with the appropriate tools for the job. Callus is an area of hyperkeratosis or hardened skin that forms on the feet most commonly over weight baring areas and specifically pressure areas. A callus build up at the heels is common also and often result in cracks or fissures. Callus can cause pain or a burning sensation if left untreated. Your podiatrist can remove callus in a pain free way and give advice on how to manage and prevent them. They are usually caused by pressure as a result of poor foot mechanics and can be contributed to by skin dryness and ill fitting footwear. In some cases orthoses help to reduce pressure areas and reduce callus formation. Hard Corns are a localised formations of hyperkeratosis or hardened skin that often form in the shape of a cone. They vary in size and depth and usually cause pain. they tend to form over pressure areas as a result of poor foot mechanics in particular on the tops or tips of toes and over joints under the foot and contributed to by skin dryness and ill fitting footwear. Soft Corns are like a rubbery clump of soft skin that forms between the toes due to rubbing and the skin stays soft due to maceration or dampness between the toes. They are usually painful. Both types of corns are easily removed and treated by your podiatrist and we give advice on how manage them in a preventative way which involves addressing the pressure to the area. we advise against home remedy treatments such as corn pads. corns can be deep and are easily infected and require treatment by your podiatrist. Warts – also known as Veruca Pedis, Plantar warts and Papillomas, are a living growth caused by the Human Papilloma Virus (HPV). Warts can appear anywhere on the feet and are usually cauliflower like in appearance and painful to squeeze. If over a weight baring area they become quite flat and are pushed back into the skin which often causes pain to walk. There are several treatment options for warts which will be discussed with you by your podiatrist – at our clinic we offer pain and chemical free treatment options in particular for children. Warts are contagious and often caught in public pools and showers so make sure you wear thongs at all times at these venues. Dry skin is very common on the feet and occurs for a number of reasons including a lack of perspiration (also known as anhydrosis) exposure to warmer weather with open footwear, as a result of conditions such as tinea, psoriosis and diabetes. Some medications and hormonal changes in the body can contribute to dry skin and in some cases it’s simply due to age. Dry skin contributes to a build up of callus in some areas of the feet and can result in cracks or fissures of the skin which is common at the heels. Cracks in the skin are often painful and can be deep at the heels increasing the chances of infection. Your podiatrist can treat callus and cracks and give advice on the best moisturizer creams for your individual feet and related conditions. Sweaty Feet can be caused by a number of issues from sweat gland disorders to exacerbation due to synthetic socks and footwear. Sweaty skin can be at higher risk of blisters, and in some cases bacteria infection which causes a strong odour. There are treatment options depending on the severity and these can be discussed along with preventative tips with your podiatrist. Blisters are a small sac of fluid that form under the skin over areas of friction. They can be superficial or form in deeper layers of skin below areas of callus. Sweaty skin is more prone to blisters and treating that can help. We recommend keeping a blister intact to avoid breaking the skin and risking infection however your podiatrist may need to drain a blister to relieve pain in some cases. Your podiatrist will discuss preventative measures and also look at your foot mechanics to give advice regarding pressure or fiction areas on your feet. Chilblains are areas of skin that are painful itchy and swollen and are caused by poor micro circulation and exposure to cold. Chilblains can appear red or blue in colour and get worse if they are exposed to heat too quickly. They can occur on feet or hands and usually only appear in the winter months. Keeping your feet warm is the key to preventing chilblains and your podiatrist can advise regarding creams to improve the circulation. If the skin breaks due to the swelling and irritation, infection can be a risk and best managed by your podiatrist. There is no known cause or cure for psoriasis, an auto-immune disorder that effects the skin and sometimes the nails and joints. It appears as scaly red and itchy patches typically on the feet, shins, forearms and scalp but can occur anywhere on the body. It can effect finger and toenails causing pitting, thickening and a build up under the nails making them difficult to cut. In some cases individuals can develop psoriatic arthritis in certain joints. Your podiatrist can help manage the symptoms of the skin and thickened toenails. Dermatitis & Excema are a group of diseases that result in inflammation of the skin. There are various conditions that cause dermatitis including as a result of allergies, irritants, and poor venous circulation, some causes are unknown. Many people suffer from some form of dermatitis which often begins in childhood. Some symptoms include blisters or dryness and thickened skin. At our clinic we can offer advice including natural remedies to help with these symptoms. Skin Cancers are cancers that arise from the skin. They are due to the development of abnormal cells that have the ability to invade or spread to other parts of the body. Skin cancers are surprisingly common on the feet. Any moles or dark patches of skin that are present and change or appear should be checked by your GP or specialist. Your Podiatrist can monitor the skin on your feet closely – especially for people who find it difficult to get down and see their feet – and will refer you to your GP for further assessment if they are concerned. High arched or supinated feet usually are quite rigid with more limited joint range of motion. This foot type isn’t able to absorb shock so well at the feet which then travels up the leg and can effect the knees and even hips and lower back. A high arched foot usually has claw toes and retracted tight tendons on the top of the feet – these muscles have to work hard to prevent lateral instability during gait. High arch or supinated feet usually have a lot of pressure under the balls of the feet along with a callus build up and can be prone to plantar fasciitis and heel pain due to the tightness through the arch. This foot type is more complex to control than flat feet and often orthoses are indicated along with extra shock absorption including with footwear. Tendinitis is the inflammation of a tendon usually due to over use or a sudden increase in activity especially with an already tight tendon. Any tendon in the foot can become inflamed but the most common being Achilles Tendonitis. The achilles tendon is the largest tendon in the body and attaches to the back of the heel bone. Inflamed tendons are usually painful during activity and can become swollen. A stress fracture is a small crack in a bone, or severe bruising within a bone. Most stress fractures are caused by overuse and repetitive activity, and are common in runners and athletes who participate in running sports, such as soccer and basketball. Weight baring bones in the foot are the most common sites for for stress fractures – in particular the 2nd and 3rd metatarsals in the middle of the foot. A stress fracture will be painful to touch at the site and with activity, and the pain subsides with rest. There can be swelling or bruising in the area also. Your Podiatrist can diagnose a suspected fracture and will refer for further tests such as an X-ray to confirm their diagnosis then follow up with the appropriate treatment plan. The plantar fascia is a thick band of tissue underneath the arch the is attached to the heel bone and into all the joints under the ball of the foot. Plantar fasciitis is the inflammation of the plantar fascia where it joins the heel and pain commonly radiates into the arch and is worse first thing after rest. This condition is common with flat or pronated feet, also with high arched feet and contributed to by achilles tendon tightness and excess weight. Your podiatrist may strap your feet initially and advise re stretches etc and treatment usually involves a bio-mechanical assessment and orthotic therapy and sometimes further tests such as an Ultra Sound are required. Sesamoid bones are bones that are not attached to another bone via a joint but are embedded within tendons or muscles. The tendon that runs under the ball of the big toe has two small sesamoid bones embedded within which help with act as a pulley and help the joint weight bare and propel the body forward. Sesamoiditis occurs when the tendon becomes inflamed and irritated, pain usually develops gradually under the ball of the big toe especially when stepping forward. The sesamoid bones can fracture and pain will be felt immediately in these cases. Swelling may or may not be present. Your podiatrist may strap and pad the area to relive pain in the short term and assess footwear, biomechanics and may recommend orthotic therapy. It is common amongst sports people and ballet dancers. Heel pain can be as a result of bruising, calcaneal stress fracture, tight achilles, or a lack of shock absorption as the heel strikes the ground during gait. Heel pain can also be caused by heel spurs which are often associated with Plantar Fasciitis and develop most commonly where the plantar fascia joins the plantar surface of the heel as a result of micro tears in the tissue. Bleeding into the tissue calcifies and spurs form. Spurs can also occur at the back of the heels where the achilles tendon attaches. An X-ray will confirm diagnosis but treatment is similar to plantar fasciitis – strapping and shoes padding initially then further assessment of foot mechanics and likely orthotic therapy. Some heel spurs cause no pain. Your Podiatrist can diagnose heel pain and advice you on the best treatment options. A neuroma is a thickening of the tissues around a nerve in the toe, most commonly the nerve between the 3rd and 4th toes, referred to as a Morton’s Neuroma. Neuromas cause sharp or burning pain that gradually gets worse over time as the nerve becomes more irritated and swollen, pain radiates into the toes. Common causes are poor foot mechanics, certain sporting activities and high heeled footwear. Your Podiatrist can diagnose a neuroma and use padding to reduce pressure to the area – then assess foot mechanics and commonly orthotic therapy is indicated along with changes to activities and footwear. Chronic neuromas that don’t respond to treatment may require cortisone injections or surgery. Bursas are sacs of fluid that occur in the body between joints and tendons to assist the smooth movement of the tendons over the joint. Bursitis can form anywhere in the foot to protect joints from friction and commonly occur in the ankle or between the metatarsal heads (ball of the foot). Underlying poor foot mechanics can contribute to areas of friction and orthotic therapy may be indicated. Your podiatrist may refer you for an ultra sound to confirm the diagnosis and sometimes cortisone injections are used to reduce the inflammation and pain. Shin Splints or Compartment Syndrome occurs when muscles of the shin swell up but are restricted by the sheathe around them made of fascia which results in pressure that causes pain. Fascia doesn’t stretch much so pressure builds up and can cause damage to nerves and muscles due to reduced circulation and a lack of oxygen to the area. This condition can be caused by a fracture or a deep bruise or trauma. Chronic shin splints usually result from over use often by sports people and require rest. Often there can be an underlying mechanical issue that causes the over use of the muscles and can be helped with orthotic therapy. Tired legs are often an indication that the muscles of the leg are being overused often due to poor foot alignment and mechanics. Children with poor foot and leg alignment often complain of tired legs and want to be carried after a certain distance of walking. A full bio-mechanical assessment and gait analysis allows your podiatrist to determine if leg muscle overuse is linked to the foot mechanics and alignment and the best treatment plan from there. Muscle cramps can be caused by a number of issues including muscles over use, mineral deficiency or poor blood circulation to the muscle. If muscle cramps occur during walking it may indicate a lack of blood supply and you should see your GP as soon as you can. Podiatrists can diagnose and treat all kinds of wounds and ulcers which can result from a range of issues including, trauma, injury, pressure related, footwear related, pressure from thickened nails, or as a result of poor circulation or complications from conditions such as neuropathy or diabetes. Minor wounds and ulcers can be managed at our clinic however more chronic or high risk patients are most likely referred to specialised wound clinics or the Royal District Nursing Society for those who find it difficult to attend regularly. Hammer toes can occur at the 2nd 3rd or 4th toes where the toe is bent at the middle joint so they resemble a hammer and can be flexible or become rigid. Hammer toes are caused by ill-fitting shoes over time or muscle imbalances due to poor foot mechanics where the tendons under the toes tighten. These toe often develop corns or callus on top of the joints. Some rigid hammer toes require surgery, most can be helped with regular removal of corns, padding and a change in footwear as advised by your Podiatrist. CLAW TOES – result from the toes clawing and gripping down at the tips, they are bent down in the middle and up from the ball of the foot joints along with retracted tendons on the top of the foot. Claw toes and tight tendons can be a symptom of the muscles in the foot working hard to try to stabilize the feet during gait due to unbalanced foot mechanics and are common with either pronated (flat) feet or supinated (high arched) feet. The tops and tips of a clawed toe are more at risk of pressure related corns and callus. Clawing and retraction can also be a symptom of nerve damage in conditions such as diabetes. Treatment options include corn and callus removal, toe padding and exercises to stretch the tendons and footwear advice. Children can grip with their toes when standing and walking and this can often be an early sign of an unbalanced and unstable foot. Orthotic therapy can be indicated for both adults and children to stabilize the feet and remove the need for toes to grip and ease or prevent tendons tightening and retracting. Flat Feet, Pronated Feet, Rolled in feet usually have quite flexible joints and the range of motion to roll in or collapse through the arches. This foot type can adapt to uneven ground but often more muscle energy is required than normal during gait to maintain unstable joints thus resulting in fatigue or tired aching feet and legs. Flat feet are literally that – little or no arch there is often a hereditary component and in some cases there is no associated pain. Pronated feet or rolled in feet however do not necessary always result in a lowered or flat arch. Pronation is the motion of the joints in the rear foot that control to some degree how the whole foot operates. Feet that pronate during gait appear to be rolled in at the heels and medial ankle and sometimes have a lowered arch but not always, and there is excessive pressure under the ball of the big toes when stepping forward. Pronation at the foot can also result in internal rotation at the legs and knees. There are many symptoms or foot conditions that can be as a result or contributed to by pronated feet and your podiatrist can assess and explain how your feet function and the related issues and then advise on the best treatment plan to suit your feet. Orthotic therapy is often indicated with flat feet, pronated or rolled in feet. Pronated feet don’t always present with pain however a range of potential issues related to your pronated feet may occur at some stage and our experienced Podiatrists are able to advice you on preventative orthotic therapy – especially with children – related to your feet and hereditary history. Pain in general in the foot, lower limb and body isn’t normal and should be assessed and investigated. There are a wide range of specific conditions, injuries, systemic diseases and postural issues in the body that can have an impact on and result in foot pain. Inappropriate footwear can contribute to in particular foot pain but also impact on ankle and leg pain as well. Foot mechanics and alignment play a very important role in the alignment and function of the entire body and can contribute to pain in other areas of the body commonly the knees hips and even the lower back. At Podiatry4Kids&Adults we assess the feet and the whole body in relation to your pain and use our knowledge and experience to diagnose and treat accordingly. Diabetes Mellitis is a group of metabolic disorders where there is a high blood sugar level in the body. Type 1 involves the pancreas not producing enough insulin and usually occurs in younger people including children (juvenile diabetes) . Type 2 involves the body resisting insulin and is more likely to occur in middle to older adults as a result of poor diet and excess weight and lack of exercise. Gestational Diabetes is a third type that can occur in pregnant woman with no prior history and often resolves post-natally. Diabetes is a complex disorder and complications can effect the circulatory and neurological systems which can have a big impact on the feet. A gradual loss of sensation and or circulation in the feet can cause problems with wound healing, injury to the skin due to lack of feeling, balance and motion, and the general health of the skin and nails. Foot health and regular monitoring is essential for diabetics including a diabetic foot assessment conducted annually and more frequently in high risk cases. Your podiatrist understands the effects of diabetes and can provide treatment and preventative advice for the feet. Diabetics are eligible for Medicare EPC rebates for Podiatry – please see your GP for a referral and care plan. Arthritis is the inflammation of one or more joints in the body and commonly found in the joints of the feet. There are many types of arthritis the main two being Osteo Arthritis (OA) and Rheumatoid Arthritis (RA), which both effect joints in the feet. OA is due to wear and tear on a particular joint and common in middle age but can effect young people too especially sports people. Joint cartilage gets worn down gradually between the joint and becomes painful. RA is a chronic auto-immune condition that effects several joints in the body including the hands which can make it difficult for people to cut their own toenails. Other contributing factors include, poor foot mechanics resulting in poor joint alignment of the foot ankle and knee, injuries to joints, bunions and HAV, and excess weight. Symptoms include painful joints, especially with motion, swelling and inflammation. Your podiatrist can advise you on footwear, possible orthoses or shoe padding, and changes in activities to minimise pain and further joint damage. Peripheral Neuropathy is damage or disease that can impair sensation or movement in the feet. There are several different types of neuropathy some related to injury or traumas others due to systemic diseases such as diabetes and can be due to medications, surgery or treatments such as chemotherapy. There are a range of genetic diseases and inflammatory diseases that can cause neuropathy also. Podiatrists are trained to assess neurological status in the feet and will monitor conditions such as diabetes closely and can help diagnose the cause of other neuropathies that present to the clinic. Advice on self management and footwear is an important part of how your podiatrist will manage your feet if neuropathy is present. Many complications can arise in the feet as a result of neuropathy and regular Podiatric care is recommended. Gout is a form of inflammatory arthritis as a result of high uric acid levels in the blood which crystallise and are deposited in the joints and surrounding tendons and tissues – most commonly the joint of the big toe. An attack of gout is usually rapid and very painful with a red hot swollen joint. Gout is caused by a combination of genetic factors and diet. Common food that can trigger gout if consumed in large amounts – red wine and beer, strawberries and tomatoes. Your Podiatrist can diagnose an acute attack and provide some relief with padding. Seeing your GP is also important to discuss medications the can help during an acute attack and that can be taken to prevent future attacks. At Podiatry4Kids & Adults we can recommend a chemical free cream to help relieve symptoms. Numbness in the feet can be caused by a range of things such as excessive cold, nerve damage, neuromas, poor circulation, chilblains, pressure related, complications resulting from conditions such as Diabetes, side effects from treatments such as chemotherapy or be referred into the feet via compression of a nerve in the spine. Numbness can be temporary or ongoing. Your Podiatrist can carry out several tests and consider all of these factors to diagnose the cause of the numbness and then recommend the best treatment. Some nerve damage cannot be restored and further tests may be required to confirm some diagnoses. Oedema (Swelling) – peripheral oedema is an abnormal amount of fluid retention below the skin in the foot ankle or leg and can be caused by systemic diseases, pregnancy in some women, either directly or as a result of heart failure, or local conditions such as varicose veins, thrombophlebitis, insect bites, and dermatitis. Lymphodema is another type of oedema that is due to an insufficient lymphatic system. Localised swelling in the foot ankle or leg can result from an acute injuries including breaks or soft tissue damage, or inflammation, arthritis or post surgery. Chronic swelling can require the use of compression stockings. Your podiatrist can help diagnose and help manage this condition depending on the cause and what further tests may be required. During pregnancy there are hormones in the body that relax ligaments in preparation for child birth. This in combination with extra weight in later pregnancy results in a lot of extra pressure on the feet and a flattening of the arches. Some women also experience swelling at the feet and ankles due to the extra pressure on the vascular system in the pelvic area. During pregnancy women often attend for regular nail cutting due to an inability to reach and see the feet. A Podiatry assessment and advice may be required after giving birth as sometimes changes to the feet during pregnancy remain and can cause pain. It is often common to go up a foot size post-natally.